How to Host a Fabulous Oscars Party! The glamour and excitement of the Oscars is contagious, so consider inviting some friends to join you for an evening of star-gazing! The 83rd Academy Awards presentation will be held on Sunday, February 26, at 7 p.m., ET and calls for an Oscars party that is all sparkle and shine! Oscar nominations will be made on Tuesday, January 25th at 5:30 a.m. PT, so check out the official award website, oscars.org for the full listing along with history and trivia. Go to the movies! Try to make sure that you’ve seen at least a few of the most commonly nominated films. Begin your party at 5 or 6 p.m. and end at 8 p.m., sending your guests home in time for the actual award ceremony. If you are an avid Oscar fan, this is probably the best plan for you. You’ll have had fun with your guests, but will be able to enjoy the show in peace and quiet! Begin your party at 7:30 or 8:00 p.m. and end the party when the award show is over, which can be late! With this type of get-together, don’t forget that the TV may well be the focus of the party! Keep the area around the TV clear and if you are inviting a crowd, consider setting up multiple TVs! Arrange chairs and floor pillows around the TV. A menu of easy finger food will keep the party flowing. However you choose to invite your guests to your Oscars party, encourage them to glam it up! Gowns, glitter and boas for the women, and black tie suggested for the men! When else will you be able to dress up like this on a Sunday night! 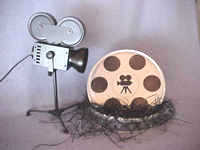 “Reel” Movie Film Tins – from take1.com (pictured at top) you’ll find tins in 6 sizes with prices beginning at $3.99 each. Write your invitation on a circular piece of paper cut to lay flat inside the tin. Gold and silver metallic confetti would be a fun touch! Cocktails are definitely in order on Oscar Night! InStyle magazine has done a great job in creating signature drinks for Oscar Night. Consider Oscar 79 Cocktails, The Winner and Liquid Legend. Champagne is also always appropriate! When serving cocktails, wine or champagne, it’s important to use the appropriate stemware. Don’t worry, this will not blow your party budget! Linens ‘N Things offers a line of glassware called “Everyday Basics.” 12 wine goblets or 12 champagne flutes retail for $9.99! And of course, we all have those ever present 20% off coupons! Martini glasses are $14.99 for a dozen! Remember, once these glasses are bought, you will always be able to share them with friends who are entertaining in the future! Better yet, get together with two other friends and each buy one type of glass. Agree to always share! For a more substantial offering, serve a spiral cut ham with tiny rolls and gourmet mustards, or a beef tenderloin, sliced and served at room temperature with baguette slices and horseradish sauce. A quick horseradish sauce can be made by blending a cup of light mayonnaise with fresh horseradish sauce to taste. Even Trickier – Get even trickier with these movie-themed menu ideas from Epicurious. Voting Ballots – Provide each guest with a ballot for voting for their choices for Oscar winners! Download an Oscar Party Pool Sheet from chiff.com. Party Pool – If you’re the betting type, collect small amounts of money with each completed form. The pool goes to the guest with the greatest number of accurate predictions! Other fun prizes are movie gift certificates, BlockBuster gift cards, or bottles of champagne. 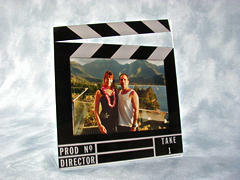 Take Snapshots of Your Guests – Pretend to be the Paparazzi and snap photos of each couple as they arrive! During the party, have a teenage helper print out the photos. or Four-Star Movies: The 101 Greatest Films of All Time . DVDs – A DVD of a former Oscar winning film. or the sound track to one of the nominated movies, see Amazon.com . CDs – Burn CDs featuring your favorite award winning songs! At Acoustic Music, you’ll find a complete listing of songs that will definitely bring back some great memories: “Let the River Run” from Working Girl, “Take My Breath Away” from Top Gun, and “Moon River” from Breakfast at Tiffany’s to name just a few! Splits of Champagne – For a quick and easy favor, wrap splits of champagne in cellophane bags. Tie with metallic star trim. Host a Fabulous Mardi Gras Party! Fun Valentine’s Cocktail Party Plan! Host a Spectacular Super Bowl Party! Host Bee, your ideas are wonderful!! I was waiting for this specific site, and it was worth the wait! Can’t wait to use some of the ideas! Props from the movie sets can come from a variety of sources. Often, after a film’s premiere, the studio will auction off many of the props and costumes used in the film for the purpose of charity.